Laughter is a shared experience; if someone cracks up in your vicinity, you are likely to follow suit. Psychologists consider laughing a social signal that strengthens bonds between people and relieves tension. We hear laughter, and then we enjoy ourselves. The trigger is the reason why, through the last half-century and to this day, TV producers have "sweetened" shows with additional laughter, whether by staging the comedy in front of a live, studio audience or utilizing pre-recorded sounds known as a "laugh track." These days, you won't hear them outside network sitcoms (or Netflix shows aping the style), but back in the 1960s, you couldn't watch a TV comedy without hearing the same laughs over and over again. These canned chuckles and guffaws have their own scientific explanation, too. With a mind for automation and the heart of a showman, Naval engineer Charley Douglass became one of the most sought-after minds in Hollywood history, simply by trapping laughter in a box. Although born in Guadalajara in 1910, Douglass' family took him to the United States two years later to avoid the political powder keg of the Mexican Revolution. His father worked as an engineer, and Young Charley would follow in his footsteps, graduating from the University of Nevada with a degree in electrical engineering. He joined the Navy during World War II, working on shipboard radar systems. After his service ended, Douglass returned to civilian life as a sound engineer for CBS Radio. There, he noticed that some of the station's programming, recorded in front of a live audience, benefited from having that audience laugh along, while pre-recorded shows felt emptier. To fill the gaps, Douglass sifted through hours and hours of programming, categorizing the wide variety of laughter from shocked titters to deep belly laughs, excerpting the outbursts that fit the scenes. Asking actors and actresses to provide additional bits of laughter, the engineer compiled hundreds of recordings onto loops of magnetic tape that could be played over and over again seamlessly. With the wealth of replayable laughs, he built a device that allowed him to control each outburst with pinpoint precision. It wasn’t long before the nascent medium of television realized that his device could help stimulate audiences new to viewing entertainment in their homes. Early TV programs were set up like stage shows, but producers couldn’t depend on them to deliver the level of response they wanted every time. Even worse, if actors screwed up lines and had to re-tape them, the laughs were always lessened the second time around. The Laff Box soon became Hollywood's secret weapon, punching up reactions to make everything seem funnier. In the early days, Douglass used the Laff Box primarily to enhance existing footage that was already filmed before a live studio audience. The Hank McCune Show, a short-lived 1950s sitcom that featured a variety show host who got into comedic predicaments both on and off stage, was the first series to utilize the machine. The presence of a laugh track was actually used to promote the show, with NBC billing it as a new technological marvel. The introduction of videotape moved TV away from live performance to something more composed, where the same scene would be shot multiple times from alternate angles and pieced together in editing. This didn't mesh with having a studio audience, because there was no way to control the volume and enthusiasm of their reactions between takes. The Laff Box solved those problems. Now producers could cue every outrageous moment and resolve every audience reaction at exactly the level they needed. If a joke didn't land live, a little extra juice from the machine punched it up. For a hundred bucks, Douglass would wheel the Laff Box to the studio on a dolly, sit in a screening room with the producer and take notes as to where they wanted audience reaction. Douglass stoked Hollywood's demand for artificial laughter by cloaking every facet of his operation. Nobody but his immediate family members were allowed to look inside the Laff Box and see how it worked, and he kept the 2-foot tall box tightly padlocked and rarely left it alone. While on the clock, he locked himself away in a private room and painstakingly dubbed in the audio using his machine, a process that took about a day. In 1960, Douglass founded Northridge Electronics to peddle his laughs to the highest bidder, and hired an audio engineer named Carroll Pratt to be his second-in-command. At their peak the duo worked up to 100 hours a week, sweetening TV programming as well as radio shows and live albums. The Laff Box changed the pacing of modern comedy. Writers would instill new sitcoms with a rhythm that left spaces for the audience to react. Previously, the rapid-fire pace of vaudeville made comedy difficult to write for extended periods, as “dead air” was frowned upon if a joke didn’t land. Now, with laughs guaranteed after every line, performers built in pauses to let the machine do its work. In videos where enterprising editors have cut the laughs out of popular sitcoms, you can see how the pace of the dialogue feels unnatural without the counterpoint of canned laughter. The revolutionary innovation did not go overlooked; in 1992, Douglass was honored with an Emmy for technical excellence for his Laff Box. After his retirement, Charley's son Bob took over Northridge Electronics and continued to improve the technology. Modern laugh track operators use a laptop computer to deliver a wide range of sweetening effects, from traditional laughs to emotional sighs and even unique signs of appreciation from foreign cultures. Northridge’s software can overlay and sequence as many as 40 at once, creating a rich tapestry of artificial audience ambiance. But these days, fewer and fewer jobs exist for them. Starting in the late 1980s, TV producers began moving away from canned laughter. Writers applauded the change, saying that it freed them up from the constricting rhythm of non-stop jokes to explore more subtle character-based humor. Think about what a show like The Office would have been like with an artificial laugh track, for example. Chuck Lorre (creator of hits like The Big Bang Theory) insists that absolutely no audio sweetening happens on any of his shows, but even his most dedicated fans have trouble believing that. The shows that do use laugh tracks, like Netflix's new One Day at a Time, deploy them in service of nostalgia. Riffing on Norman Lear's 1975 sitcom of the same name, it's only fitting that the show be sweetened like it. Other shows have dispensed with the Laff Box operator entirely. How I Met Your Mother was filmed multi-camera but with no studio audience. To get their laugh track, producers would show a finished edit of each episode to small groups of viewers and record their reactions in real time. 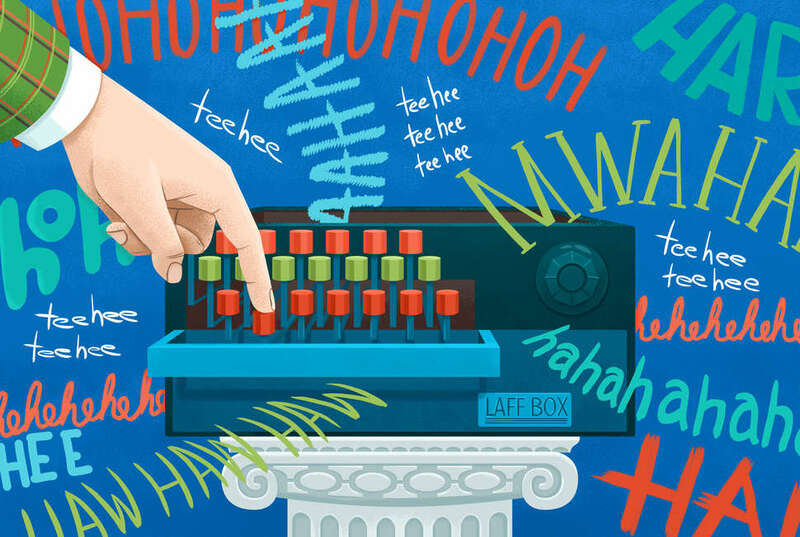 Amazingly, the actual physical Laff Box showed up on an episode of Antiques Roadshow in 2010, giving the world their first peek at the inside of the device. The machine featured 32 typewriter keys, each one of which would cue playback on an individual tape loop featuring ten laughs. A foot pedal controlled master volume, allowing Douglass to fade the sounds in and out realistically. It was a remarkable piece of engineering, a versatile device more musical instrument than machine. Even though canned audiences are primarily a thing of the past, it's amazing to think about how this bespoke invention changed the way the world laughed. K. Thor Jensen is a writer and cartoonist who lives on a tiny island in a big ocean with his family. He has been excavating the upside-down of the internet since 1997.